With this Baselworld debut, Patek Philippe is expanding its collection of complicated Nautilus models, endowing the chronograph with the Travel Time function that indicates the time in two different time zones at a single glance. The new watch combines two highly popular complications and features additional functions for enhanced everyday convenience. For nearly forty years now, the casually elegant Nautilus has enjoyed iconic status. It melds superb functionality with impressive ruggedness. The physique and resilience of its case have always been among its key characteristics. 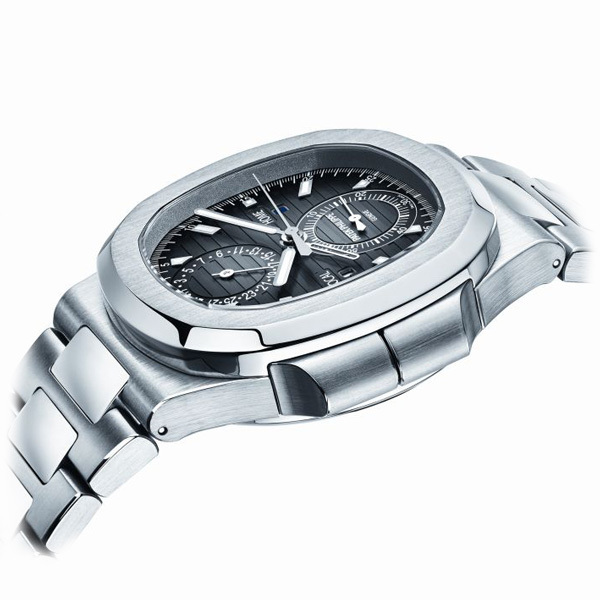 The integration of horological complications such as an analog date and a moon-phase display boosted its appeal, and in 2006, when Patek Philippe presented the first Nautilus chronograph, it became clear that this timekeeping instrument is what physically active watch connoisseurs had been waiting for. Now, the coveted chronograph has been enriched with the useful Travel Time function as reflected in the name Nautilus Travel Time Chronograph Ref. 5990/1A. The display of a second time zone and the chronograph are two complications that aptly symbolize personal mobility and the active lifestyles of our era: at home all around the world but always with a close eye on home. 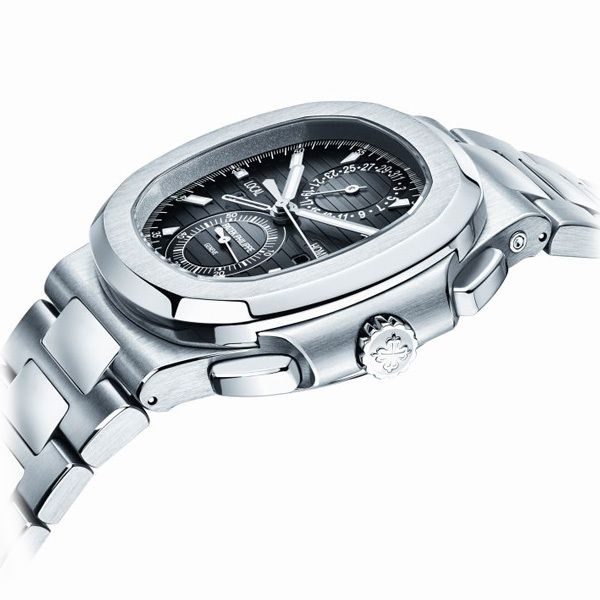 For the time-zone function, the new Nautilus Travel Time Chronograph has two hour hands on the same axis. The lower one is skeletonized, and the upper one matches the style of the minute hand. The skeleton hand displays home time while the solid hour hand indicates local time. At home, where both times are identical, the two hands are superposed. When the owner moves to another time zone, the hour hand for local time can be adjusted in one-hour steps with the plus and minus correctors. On eastbound trips toward the sun, the local-time hand must be adjusted counterclockwise and incremented in the opposite direction when traveling westbound. The skeleton hour hand is not affected by such corrections and continues to display home time. In the Nautilus Travel Time Chronograph, this useful function is complemented with two separate day/night indications, labeled LOCAL and HOME, that display the time of day in the respective zones. They reduce the likelihood of unintentionally calling loved ones at home in the middle of the night. seems so self-evident as regards the silhouette proved to be a formidable challenge for the casemakers: each additional pusher requires a separate bore in the case, yet it still has to be water- resistant to 120 meters (12 bar). 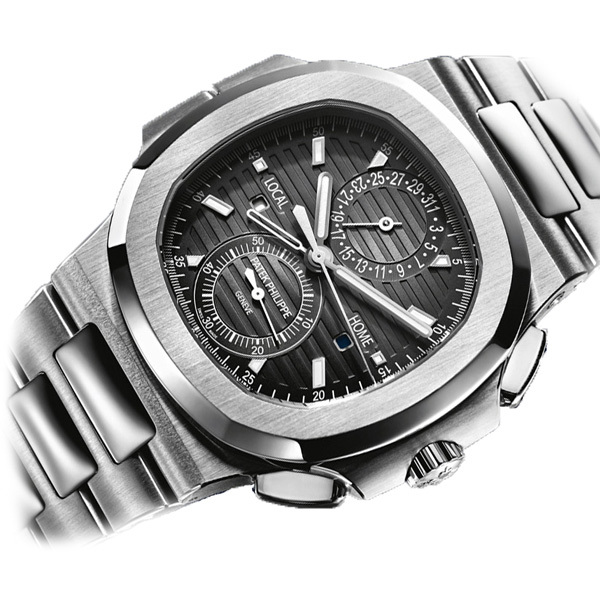 But the new Nautilus Travel Time Chronograph fulfills all water- resistance specifications, reflecting the high-precision manufacturing techniques mastered by Patek Philippe's case ateliers and the use of latest-generation sealing technologies. In the course of the redesign project, the two chronograph pushers at 2 and 4 o'clock were minimally shifted closer to the crown. In their new positions, they can more directly transmit the commands to the chronograph caliber, and this is clearly discernible in a softer response with clearly defined trigger points. Additionally, the new configuration creates the space needed to integrate a date correction push piece in the bracelet lug at 1 o’clock. 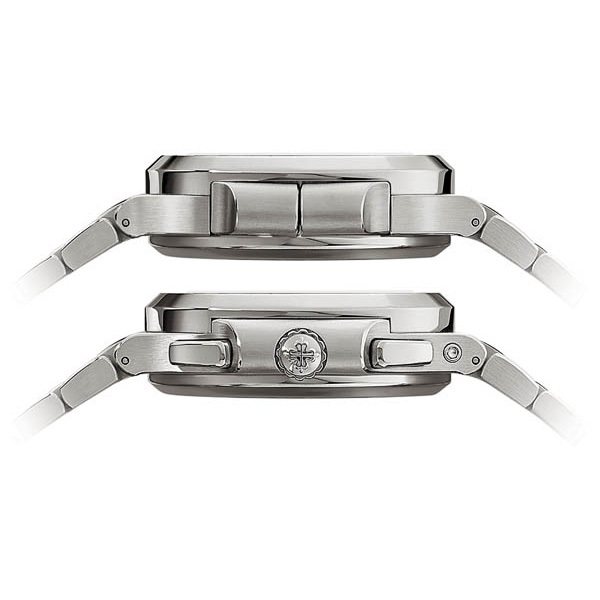 The now legendary stainless steel Nautilus bracelet, inseparably connected to the case, has smoothly satin-finished outer links and mirror-polished ones in the middle. It guarantees an extremely comfortable and snug fit, and the stainless steel foldover clasp provides extra safety. The new time zone function also has an impact on the dial, which presents the typical Nautilus style in a new arrangement. The dial is black with a slight bright-dark gradation from the middle to the periphery and features the familiar horizontally embossed Nautilus pattern accentuated with ten applied luminous hour markers in 18K white gold. Positioned slightly below the center axis, the day/night indicators are new elements: one at 9 o'clock for local time as indicated by the luminous hour hand, and the other at 3 o'clock for home time represented by the skeletonized hour hand. The new analog date at 12 o'clock and the new 60-minute chronograph counter at 6 o'clock round off the dial. This symmetrically organized layout sets the stage for the baton-style hour hand with a luminous coating for local time, the skeletonized home-time hour hand of the same size, and the longer baton minute hand, also with a Superluminova coating, for both time zones. The slender chronograph hand is made of rhodiumed steel and with its wide counterweight exhibits the same lancet shape as the small white lacquered hand of the 60-minute chronograph counter at 6 o'clock. It stands in visual equilibrium with the delicate baton-style date hand in white lacquered white gold at 12 o'clock. All of the complications mentioned above can already be found in other Patek Philippe timepieces, but the way they are combined in the new Nautilus Travel Time Chronograph is a premiere. It called for the development of the new caliber CH 28-520 C FUS movement in which the chronograph mechanism, a traditional column wheel design with an innovative disk clutch, is supplemented with the Travel Time mechanism. This ingenious device dates back to a patent granted to Patek Philippe in 1959. It not only facilitates the bidirectional adjustment of local time in one-hour increments, but is also totally isolated from the going train when time-zone settings are changed. This prevents adverse effects on the amplitude of the balance and the rate accuracy of the watch. 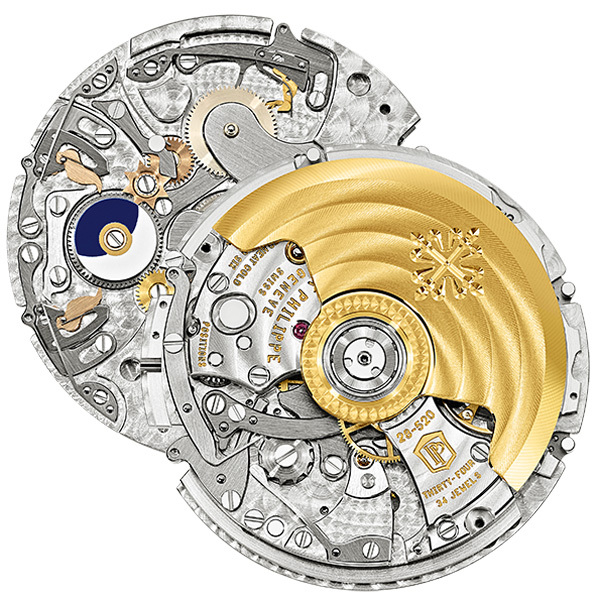 balance spring was replaced with the patented Patek Philippe Spiromax® hairspring made of Silinvar®. Thanks to its intelligent geometry, it oscillates in one plane – yet symmetrically and isochronously. The remaining features of the movement are well known. The watch is wound automatically by a heavy central rotor in 21K gold. The Gyromax® balance introduced by Patek Philippe 60 years ago beats with a frequency of 28,800 semi-oscillations/hour (4 hertz). The immaculate finish of the movement includes Geneva striping on the chamfered bridges and Geneva circular graining on the rotor. The stunning degree of peerless perfection in craftsmanship can be admired through the sapphire-crystal case back, a feast for the eyes of genuine watch lovers. Inspired by the success of its casually elegant Nautilus chronograph, Patek Philippe has now endowed this model with the highly popular time zone function, thus expanding the collection of complicated Nautilus watches with an attractive newcomer. 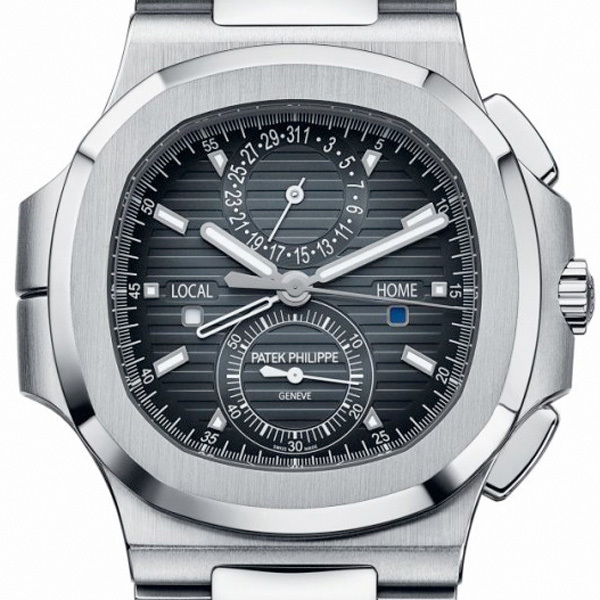 The new Patek Philippe Travel Time Chronograph Ref. 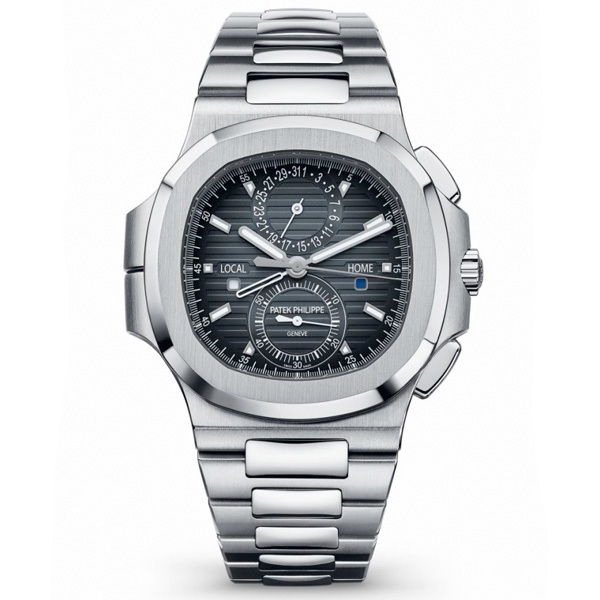 5990/1A replaces the Nautilus chronograph Ref. 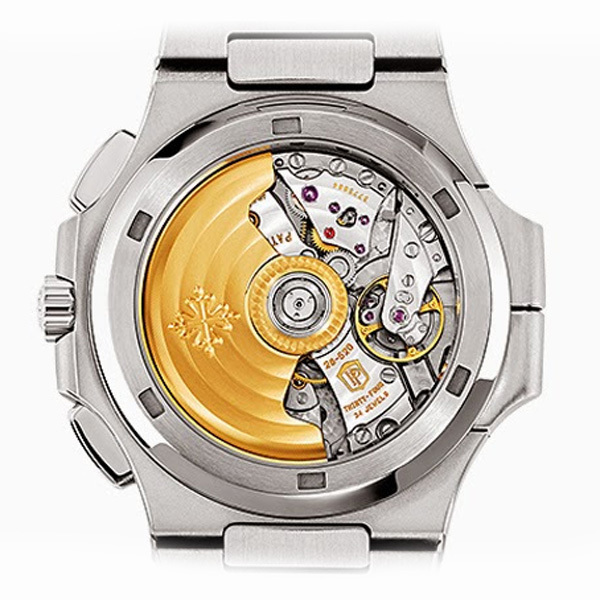 5980/1A with a steel bracelet, which was first presented in 2006 on the occasion of the 30th anniversary of the Nautilus collection. Caliber CH 28-520 C FUS Self-winding mechanical movement, column-wheel chronograph with disk clutch and 60-minute counter, sweep chronograph hand, two time zones with separate day/night indicators for local time and home time. Analog date.